In a historic step for Spain, the armed Basque separatist group Eta is this week expected to announce a definitive end to more than four decades of violence, according to sources close to the negotiations. With the former UN secretary general Kofi Annan flying into the Basque country on Monday for talks and a recent call from several hundred Eta prisoners for an end to violence, sources in the Basque country and others involved in the process say the group will make a significant announcement shortly. Senior members of Socialist prime minister José Luis Rodríguez Zapatero's government have been saying for several weeks that they expect the group to make such a move. Eta is already observing what it terms a "permanent" ceasefire, called in September 2010, though it has broken previous unilateral truces that it had deemed permanent. While it was unclear exactly what words Eta would use in its forthcoming statement, it looks set to be an irreversible step towards the end of a group that has killed more than 800 people in bomb and pistol attacks across Spain over the past 43 years. A public appeal from Annan and fellow mediators, including the Sinn Féin president, Gerry Adams, for Eta to embrace peace will provide the group with an excuse for declaring its readiness to abandon arms, according to sources. Radical Basque separatist political leaders would then imitate moves by Adams during the Ulster peace process when, in 2005, he appealed directly for the IRA to lay down its weapons. Eta was expected to react quickly, though it would stop short of announcing its dissolution. It may follow the IRA's lead by calling on its members to use exclusively peaceful means without disbanding. Those with experience of Eta, however, insist that the group remains unpredictable. The dramatic new moves would come just a month before a 20 November general election that looks likely to change Spain's government, with the conservative People's party (PP) of Mariano Rajoy predicted to win a landslide victory. Although the PP has traditionally refused to consider any sort of dialogue with Eta, it is known to have been in contact with the group during a previous ceasefire in 1998. The hawkish PP prime minister at the time, José María Aznar, whom Eta had tried to kill with a car bomb in 1995, even moved some of the group's prisoners to jails closer to home in a good-will gesture. The Basque country's Socialist regional prime minister, Patxi López, last month responded to a call from Eta prisoners for the group to embrace peace by proposing that those in jails around Spain be moved to Basque prisons. Rajoy has been careful not to comment on recent signs that Eta is looking for a way out of the dead-end of terrorism. Indeed, he has hardly talked about Eta – which was an obsession for his party under Aznar – over the past four years in opposition. The PP's local leadership in the Basque country, which has seen several of its members killed by Eta over the years, has also become far more open to helping to finesse the group's end. Listed as a terrorist group by the European Union and the US, Eta has been in decline for more than a decade, with its capacity to carry out terrorist attacks on Spanish territory seriously weakened. But attempts to wean it off violence after it called a ceasefire in 2006 failed, and the group planted a bomb which killed two people at Madrid's Barajas airport. Zapatero has been wary of the group ever since, but has been expecting a significant move from Eta before the November election. "They will definitely do something before the elections," a source close to the prime minister said. "But the end may be long and will not be easy." Eta is widely regarded as an organisation that has to come to terms with its defeat by Spanish and French policing. A decision by the group to lay down arms may provoke the appearance of splinter groups dedicated to keeping the violence going, similar to the Real IRA in Northern Ireland, according to a former senior Socialist interior ministry official. Monday's talks will see peace mediators including Tony Blair's former chief of staff, Jonathan Powell, discuss the process with local politicians. The latter include both radical separatists close to Eta and the Basque branch of Zapatero's Socialist party. Rajoy's PP will not attend. "If Eta and its supporters need this in order to bring about their final end, I want to urge them to grab this opportunity," López told journalists in New York on Sunday. 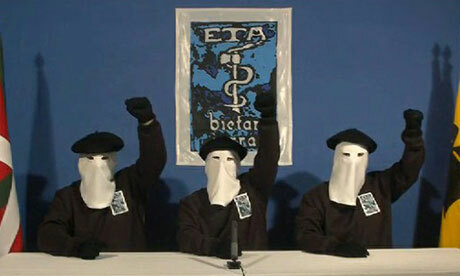 The meeting has been denounced by opponents of talks as "Eta's conference". "What is in play is the future of our country, and knowing that we can count on the help of important people and groups fills us with hope," said Paul Rios, of the Lokarri peace group, which is organising the conference.